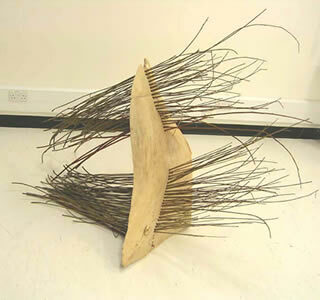 A found piece of Ash wood, approximately 1 metre in height and 16cm at its thickest point was drilled and sticks of willow were threaded through the holes. The strength and flexibility of the thin willow enables it to support the heavy Ash block which balances on a narrow edge. A block of resin was cast in a round bowl, and cut into pieces, before being built up into a single structure, approximately 20cm high, which includes curves and angles in a balanced form. 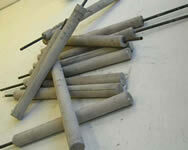 With an emphasis on repetition, the ten pilliars are concrete casts encasing steel pipes. 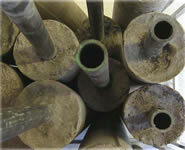 Different forms and patterns can be constructed, demonstrating the commonalities and the differences between each pillar. 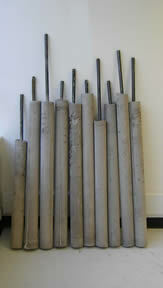 The tallest pillar is approximately 2 metres high. 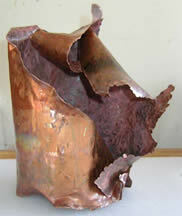 Folds of copper which integrate the inside and outside of the shape. 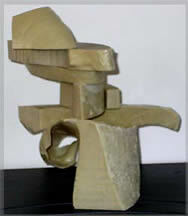 Nine Beech blocks, each 5cm x 5cm x 2cm, formed in to a simple tower with a found object set on the top. This pays homage to Constantin Brancusi.